Verm-X Crunchies for Cats are irresistibly tasty treats that can be given to your cat throughout the year as a natural method of continual intestinal hygiene control. Designed to provide lasting and effective comfort to your cat’s digestive system, Verm-X has been with made with only natural ingredients including additional vitamins, minerals and trace elements that contribute towards overall health and wellbeing. As with all natural ingredients, it can take a little while for them to become effective in your cat’s system, but once established Verm-X Crunchies will continue to support your cat and provide active control all year round. Just two of these biscuits each day to keep worms away. So much easier than trying to give them tablets. My cats look on them as treats rather than medicine. My little black feral cat Midnight loves these crunchies - I break up one on a morning and another one on a night for her (she sits and waits for me to give her them now!) 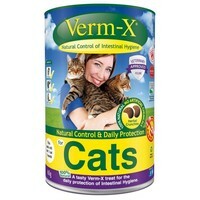 It seems very strange for a cat to actually enjoy a worming product but these go down very well indeed! They might seem a bit expensive for treats but the 120g pack lasts a couple of months (for one adult cat) and if they keep the worms away it's worth it since there's no fears re successful administration, side effects etc which you can sometimes get with regular wormers. I've seen no evidence of any worm infestation since I've started using them, but maybe it's early days yet (will report back after more months of use! )I'll definitely be buying more of these though and they're a really good price on here. All in all I'm very happy with these and think they're a great idea!